The virus is an H5N1 avian influenza strain that has been genetically altered and is now easily transmissible between ferrets, the animals that most closely mimic the human response to flu. Scientists believe it’s likely that the pathogen, if it emerged in nature or were released, would trigger an influenza pandemic, quite possibly with many millions of deaths. In a 17th floor office in the same building, virologist Ron Fouchier of Erasmus Medical Center calmly explains why his team created what he says is “probably one of the most dangerous viruses you can make”—and why he wants to publish a paper describing how they did it. Fouchier is also bracing for a media storm. After he talked to ScienceInsider yesterday, he had an appointment with an institutional press officer to chart a communication strategy. Communion of Dreams is an “alternative future history” set in 2052 where the human race is still struggling to recover from a massive pandemic flu some 40 years previously. Let’s see . . . 2052, minus 40 years . . . The whole thing is good. Remember, any given person will have a different mix of which of these factors are dominant or even present. But as a short summary, it’s pretty good. The cold & wind of the night before was part of a front moving in. So the morning came with a brilliant blue sky with few clouds and a significant wind chill. Bright & surly this morning. Our hotel specializes in gorgeous views and somewhat tepid breakfast. As this included the coffee, I’m not sure the trade-off was worth it. One got the impression that the Peppers Resort wasn’t really set up to handle groups. We’d hoped to be able to get in to see the church interior, perhaps for the choir to have a chance to sing in such a beautiful spot. But the local caretakers weren’t willing to open it up for our group. Surprisingly. So we had to settle for just looking around the outside, sheltering from the cold wind as best we could. The bus was warm and welcoming. We drove southeast, through the Mackenzie Basin, a largely empty place popular with tourists, particularly people who like to do gliding (air currents from the Southern Alps make it ideal some times of the year). It’s probably best known outside New Zealand for being the ‘land of Rohan’ from the Lord of the Rings movies. Dunedin (pronounced “done Eden”) was our destination. We rolled into the town in the early afternoon, during a rainstorm. After getting settled in our hotel, Martha decided to just rest a bit in the room. I opted to go out and about with our friend ML, exploring the city. We headed down the main street, towards ‘the Octagon.’ Which features a large bronze statue of Robert Burns. That, and the bagpipe-playing buskers, kinda give some indication of the history of the city. Yeah, it was settled by Scots in the middle of the 19th century, and it has maintained a strong Scottish identity to this day. Lots of restaurants and pubs have a Scottish/Gaelic flavor. ML and I walked pretty much the full length of the main commercial street, pausing to look into this or that shop. I was on the lookout for some nice greenstone (Pounamu – a kind of jade native to the South Island – more on this later), and ML was looking for some (more) fabled NZ woolen yarn. Between us we managed to enjoy a couple of hours walking and shopping. After a bit of rest back at the hotel, Martha, ML, and I went in quest of some dinner, and to give Martha a chance to check out the central city. We stopped at St. Paul’s Cathedral on the Octagon – the location of the choir’s performance the next evening. The rain from earlier in the day had cleared off, and while it was chilly it was quite nice for an evening walk. We settled on dinner at a pub near the hotel. They had good local beer on tap – I found out that it came from the brewery literally around the corner, and made a mental note to stop in there when I had a chance the next day. The pub-food we had was all very yummy, and overly generous in portion size. That was one thing we noticed at most pubs and mid-level restaurants: portion sizes were always quite large, at least as big as the (too big) portion sizes you get here in the U.S. At more upscale restaurants this wasn’t the case (also as you usually find here). We crashed relatively early. All the travel was starting to take a toll, even as enjoyable as it was. Scenes from a trip: into the heart of darkness. They say on a clear night you can see forever. But would the clouds ruin everything? We breakfasted, then loaded onto the bus for the airport. A quick and easy jaunt through the security checkpoint (the agents knew we were Americans, made quips about how we didn’t have to act like cattle in their country) and then a 45 minute flight south to Christchurch. We met our new bus driver there – like the one on the North Island, he was friendly, knowledgeable, personable. We got a brief drive around Christchurch, a chance to see some of the damage and rebuilding going on from the earthquakes earlier this year. The choir had originally been scheduled to perform in Christchurch Cathedral. We went by to see it. Or, I should say, what is left of it. There’s still a big debate going on in New Zealand over whether it is practical to salvage *any* of the structure. After that drive-around, we went to the Canterbury Museum and the adjacent Christchurch Botanic Gardens. Martha and I opted to walk the gardens, which was wonderfully relaxing and beautiful. Many of the plants were in full bloom, it was sunny and warm, ducks were in and out of the Avon River, there were families with children and school groups. 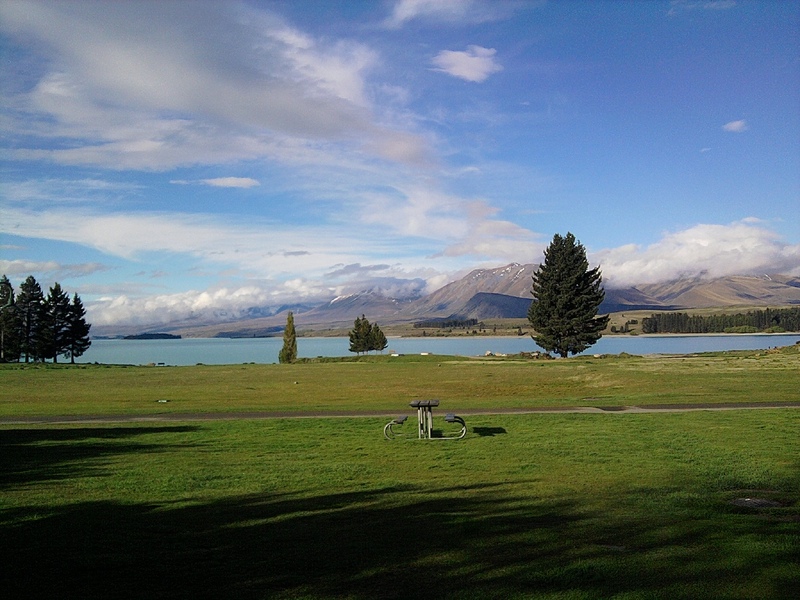 Then it was on to Lake Tekapo, located in the center of the South Island, up in the Southern Alps. It was a wet and rainy drive, very spring-like, but colder than it had been up on the North Island. The landscape reminded me very much of the inter-mountain area of western Colorado, between the different ranges of mountains. We stopped for snacks along the way, and Martha discovered the joy of hokey-pokey. 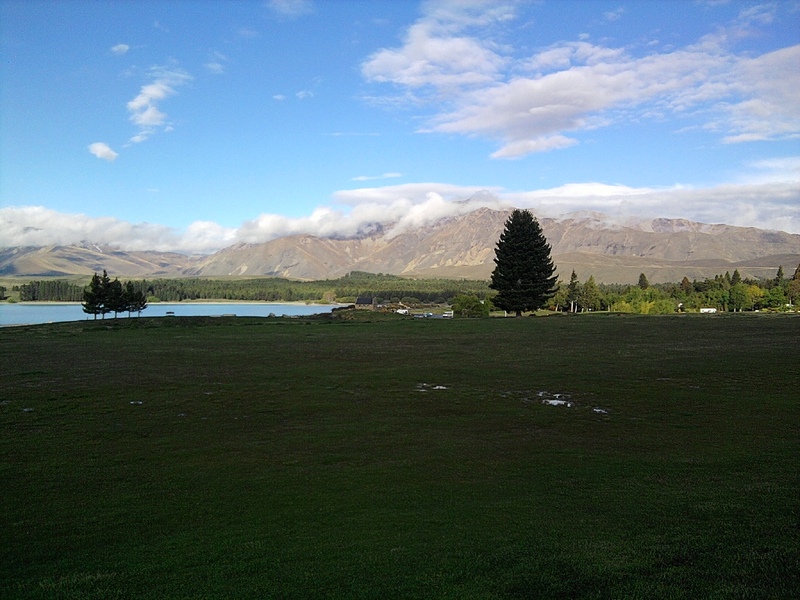 We rolled into Lake Tekapo, out the other side in an instant. There’s not much there. To our hotel, an odd sort of place called Peppers Resort. Oh, it was nice enough, but the place is sorta like an apartment or condo, with a bedroom downstairs and then a large family room and fairly complete kitchen upstairs. Which was fine, except that a second bedroom was glommed-on to some of the units, and the people in that bedroom would have to access the upstairs by going through the bedroom-bathroom hallway of the other one. Further, the units were all scattered in clusters over a fairly large campus, meaning that you had to walk outdoors for long stretches, and most of them were some distance from the meeting areas and clubhouse. It wouldn’t be bad for someplace where the weather was always warm and nice, but here it had us scratching our heads a bit. Martha and I got settled in, then decided that since the weather was clearing, we’d walk the short distance into the small town, have a look around. We had a large buffet dinner that evening with other members of the tour. It was quite good. Then after, the reason we were there: the Mount John Observatory. It’s New Zealand’s premier observatory, operated under the auspices of the University of Canterbury. Mount John isn’t all that tall – just about a thousand meters above sea level at the top – but it is located in one of the least light-polluted places in New Zealand. The lack of other ambient light sources means that it is easier to see the stars. They took us to the top of the mountain in vans, handing out loaner parkas. Because it is bloody damned cold up there, and the wind is always intense. One of the guides said that the location held the record for highest wind speed in NZ – some 250 km/h (150 mph), and that sent the domes of the observatory tumbling. We spent several hours with the different guides, all grad students and staff of the observatory, looking through 16″ and 9″ telescopes and with the naked eye. Unfortunately, there was a quarter-moon up, so it was harder to see the Milky Way, but it was still some of the best sky viewing I’ve had anywhere in my life, and of the Southern Hemisphere. Wonderful! It was getting on to midnight when they bundled us back in the vans and down to our rooms. as well as incredibly inspiring. Over the last week or so, I’ve tried to write this piece about a dozen times, only to give up and delete what I had come up with. I’m not sure whether this one will work or not. What’s the problem? Well, it’s easy for whatever I say to only be seen as bitterness. And while I am a bit bitter, that’s not the reason for my writing. The best ice cream in the world won’t sell worth a damn in the middle of a blizzard. I’ve been very frustrated with our inability to sell Her Final Year. I don’t think we’ve broken 30 sales yet. It’s depressing enough that I don’t even bother to check the sales figures these days. And it seems that nothing we do makes the slightest difference. I thought that the timing for the book would be perfect. There’s been a slew of studies and warnings about the impending crunch of an aging population, and how that will require more care-givers. Organizations such as the Alzheimer’s Association have been working hard to build awareness, create support mechanisms for care-providers and their charges. But people don’t want to think about such things. The news of the day is depressing enough as it is, with little prospect for getting better anytime soon. And it isn’t just that. I’ve noticed that increasingly, people are not in a mood for conversation. They’re in a mood for argument. Or just shouting at one another. I was relieved a couple of years ago when Brent decided to shut down Unscrewing the Inscrutable. Because I had gotten tired of having the same old arguments time and again, frequently with the same people. No one was willing to change their mind, they just wanted to rehash the same words, endlessly. The same was true of making a pro-2nd Amendment argument on the political blog Daily Kos. For years, I had been engaged, and it seemed to make a real difference – people would change their minds when presented with a cogent position, supported by facts and logic. But then earlier this year, the mood changed. And even trying to hold those conversations became pointless – no one would ever change their mind, no matter what. I’ve seen the same thing happen in other venues, as well. My writing for Guns.com is generally well received, but anything which is even the slightest challenge to the conventional wisdom or political alignment of the bulk of the readers tends to get less attention and support. If I write something which is ‘preaching to the choir’, people go nuts and love it. And it isn’t just me, either. Others have noticed the same thing, though I’m not sure anyone has phrased it in quite the same terms. I don’t think people want to be challenged at all. They want to hear familiar, soothing tones. They want to be told that they are right, and that the “other side” is wrong. They want to be certain that only they are being reasonable and open minded. Now, this is usually the case to a greater or lesser extent. People always want to have their prejudices and biases affirmed. That is a human trait – one we all share, whether or not we like it or are willing to admit it. But it has become even more strident of late. Politics in this country has been polarized for a while, and the rhetoric from all sides has been dire building to extreme. I get the sense that a kind of madness is developing, a mindless tribalism that shunts off all contrary data in favor of those things which serve the tribal identity. Things change. I think the time to rend is coming. Certainly, the season of persuasion is ending. Scenes from a trip: feelin’ groovy. There’s the grey of spring, and then the grey of fall. Temps and clouds in Wellington were about the same as we had left back in Missouri, but somehow it felt warmer . . .
Breakfast, then an optional tour through the city with Helen on our bus. First we went up to Mount Victoria, a gorgeous vantage point at which to enjoy the whole city (and location for a couple of scenes from Lord of the Rings). 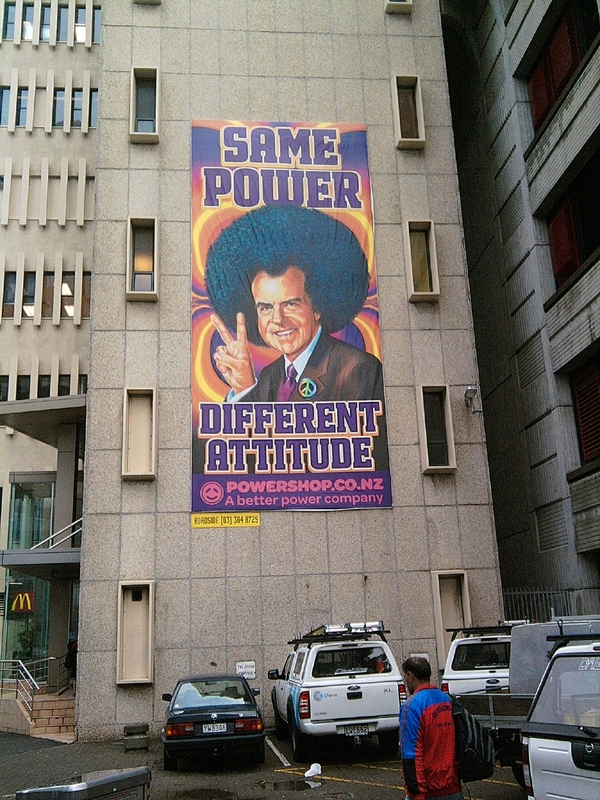 This was followed up with a visit to Te Papa Tongarewa – the national museum and gallery of New Zealand. It’s a very interesting place, a mix of the traditional and the innovative. 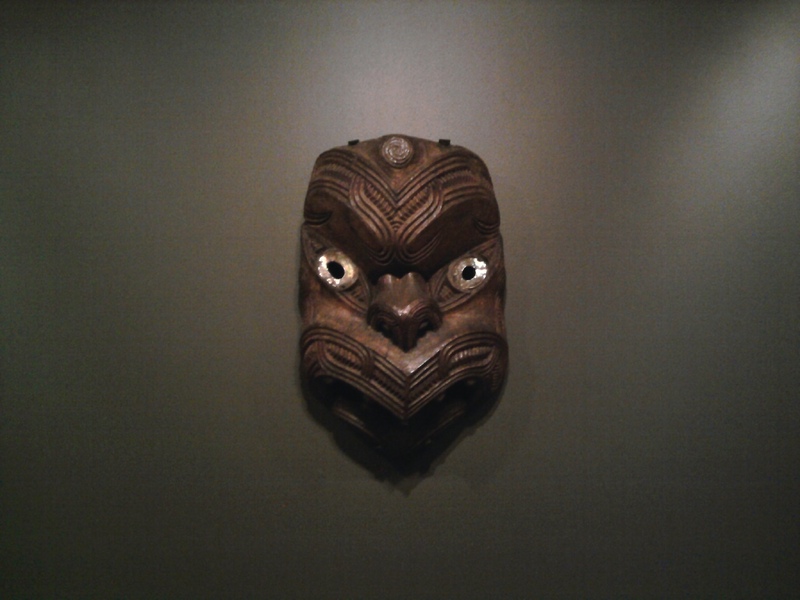 They’ve got a decent collection of modern art, and a lot of good stuff covering the history and culture of NZ, from the earliest settlements of the Maori to the present day. But what I found to be most enjoyable was the use of the built space inside the museum: it isn’t just simple layers of different floors, but rather incorporates multiple layers of open space/mezzanines so that you enjoy the exhibits from many different perspectives, creating a visual melding of the different aspects of New Zealand depending on where you are. It’s a very effective bit of architecture, and the museum staff make use of it very very well. Martha, ML, and I spent several hours enjoying the place, including a break for some refreshments at one of the museum cafes. Then it was off for a walk back to our hotel. Te Papa sits right on the waterfront of Wellington Harbor, and our hotel in the city center just a couple of blocks from the waterfront. So it was an enjoyable walk back to the hotel, past docks and seaside restaurants, then into the main shopping and restaurant area of downtown. We spent a good time just enjoying and doing a bit of shopping, then grabbed some lunch at a little local hole-in-the wall place. Back to the hotel to relax a bit. Martha had a rehearsal that afternoon, I popped out to a grocery store and got some ‘picnic’ type items for a light dinner for us. I always enjoy going to grocery stores in other countries. It is one of the best ways to get a handle on how local people live, and to see the differences between their culture and my own. I’d mentioned previously I found NZ to be more like the US than like the UK or Europe. This was another manifestation of that. Yeah, there were clear differences between this grocery store and the ones at home – different brands, some different packaging approaches (such as cat and dog food in long tubes, similar to a sausage). But for the most part you could drop any American in the place and they’d feel right at home. The salad bar and deli areas were just like back home, though with meat pies and a couple of other such distinctions. There was more lamb than you’d find in most meat cases, but otherwise it was familiar. Baked goods on display were typical. Snacks and the beer/wine department like you’d find in a Hy-Vee store here. All in all, perfectly normal. ML and I again went with the choir when they went to the Opera House that evening, and we set up to sell CDs in the lobby. It was a great place, and was in pretty good shape, what you would expect of a classic Edwardian structure which has been renovated and cared for. But the weather turned colder and wetter, and attendance at the performance that evening was fairly light. The performance itself, which included the Wellington Male Voice Choir as well, was quite good. We only sold a few CDs. Following the performance, we were all invited to the Welsh Dragon Bar – a former public toilet which now plays off that history (and the Welsh connection) with their motto: “come in for a leek.” It’s owned by a Welsh emigre, and is generally considered the best (only?) Welsh pub in the Southern Hemisphere. They’d made a bunch of Welsh & NZ finger food for the group, all of it welcome and quite tasty. The bar was mobbed, and we kept the place hopping with happy voices for a good while, some of the choir members staying on until closing time. But not me, nor Martha. We went back to the hotel and crashed. We had to be traveling again early in the morning, catching a flight to the South Island.